Number four on our list is a high floating, versatile pattern that covers a wide range of imitations. The Humpy is noted as being more of a style of patterns rather than one pattern alone although when you refer to the pattern many people often think of the Yellow Humpy pattern specifically. The Humpy pattern style is MUCH more diverse, in fact my favorite Humpy pattern is the “Hippie Stomper“…I mean… “Holo-Humpy” which is a very effective terrestrial pattern that makes a great beetle. 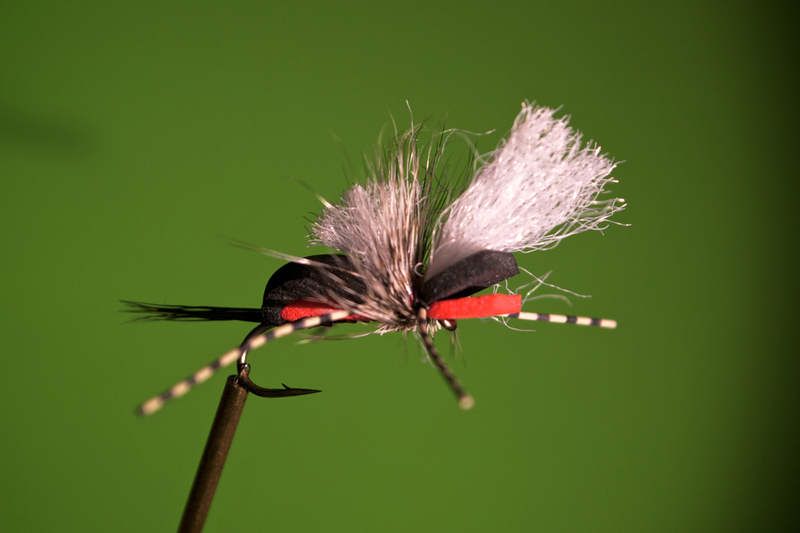 The Humpy patterns float high and make great indicators so you can use them as the top fly in a dry-dropper tandem rig with a wet-fly (such as a nymph, emerger, worm, or pupae) underneath. While the Humpy floats high it can also land on the water with a splash. This can be particularly helpful in presentations where you need to produce a little attention. Often times on windy days beetles are blown into the water and land heavily on the surface. On days like these, the Humpy shines by producing a presentation that is both noticeable upon arriving on the water but also believable as it floats. Traditional Humpy patterns work well in a wide variety of colors with yellow by far being the most popular. However, because of the highly desirable characteristics of the fly there have already been many variations of the Humpy produced and surely many more will come. Perhaps my favorite and certainly my most frequently fished version of the pattern is the Hippie Stomper tied by Andrew Grillos AKA The Holo Humpy. Paul Bruun and MidCurrent.com did a great article on the history of the updated Humpy that is well worth a read especially for the experimental fly tier. This pattern makes a great larger terrestrial pattern, is it a beetle? a cricket? a small early season hopper? YES! This pattern has proven it’s worth on the legendary Pennsylvania waters of Clarks Creek, The Yellow Breeches, The Letort, and Big Spring. It is one of my favorite top flies for dry dropper rigs. For all these reasons the many of the variations of the Humpy are in my summer trout fly box and they should be in yours!